Objective: The aim of this pilot study for a computerized assessment of visual-perceptual- motor integration was to examine the appropriateness of test items. 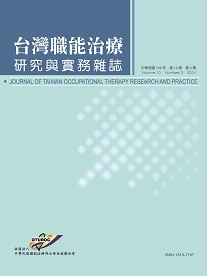 Methods: 103 children who aged from 3 to 12 and lived in Kaohsiung City participated in this study. Data analysis was focused on the following statistical methods: item difficulty, item discrimination, internal consistency and factor analysis. Results: This computerized assessment of visual-perceptual-motor integration included 11 subtests. There were scanning, imitations, copy, visual retention, spatial relations, processing speed, eye-hand coordination, figure-ground, construct, form constancy and visual closure. The items of 0.3 to 0.7 of difficulty and greater than 0.3 of discrimination were included in this assessment through item analysis. Seven subtests have good internal consistency (Cronbach's ( >0.70) among 11 subtests and two common factors could be extracted by factor analysis. The two common factors explained variance of 56.55%. Conclusion: The results of this pilot study provided the basis for correcting the inappropriate items, but also demonstrated the homogeneity existed among the items. Further study would toward the examination of cross validation, test-retest reliability, concurrent validity and establishing the national normative database into the computerized assessment.